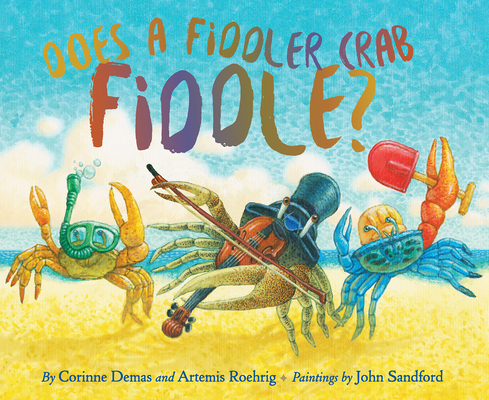 Starting with silly questions like the title, and moving on through increasingly-unlikely questions such as "do fiddler crabs ride a skateboard?," and "do fiddler crabs eat pizza?," children discover what fiddler crabs do. They don't need a skateboard - they can move sideways so shore birds can't catch them. They may not enjoy pizza, but they gobble up saltmarsh muck. Using this question-and-answer format engages children immediately, and discovering just what fiddler crabs actually do satisfies their curiosity. This is the best kind of nonfiction - engaging, fun, and filled with the kinds of details that kids love. With it's author's note providing more information, Does A Fiddler Crab Fiddle? is an outstanding nonfiction picture book for children ages 4-8. Corinne Demas is the award-winning author of thirty books for kids and adults, including the picture books The Disappearing Island, Saying Goodbye to Lulu, and The Littlest Matryoshka, and the recent YA novel, Returning to Shore. She is a professor at Mount Holyoke College and lives part of the year on Cape Cod, a great place for observing fiddler crabs. Corinne has a dog and two donkeys. Visit her website, corinnedemas.com Artemis Roehrig received her master's degree from the Organismic and Evolutionary Biology program at the University of Massachusetts. She first became interested in fiddler crabs when she worked at Wellfleet Bay Wildlife Sanctuary. Artemis lives in western Massachusetts and loves to explore nature with her two children. Does a Fiddler Crab Fiddle? is the second collaboration for this mother-daughter team. They are the co-authors of Are Pirates Polite?, a manners book in rhyme. John Sandford has worked in children's publishing for more than 30 years and has spent the last seven years as an art director with Cricket Magazine Group/ePals Media. He enjoys the variety of assignments and modes of storytelling, working in a variety of styles to suit the mood and flavor of the words. His research has taken him to South Dakota to learn about the Lakota Sioux, Pennsylvania to study the world of the Old Order Amish, and Northern Wisconsin to interview the Terrible Hodag. Booklist said of his illustrations in Snug, "Sandford captures the warmth of the domestic scenes to perfection, but his beautiful, mysterious pictures of outdoors at night will be even more fascinating to preschoolers.' Sandford's work has garnered starred reviews from Publishers Weekly and School Library Journal, CBC selections, and a Parent's Choice Gold medal among other honors. John lives in Chicago with his wife Frances, and daughter Eleanor.